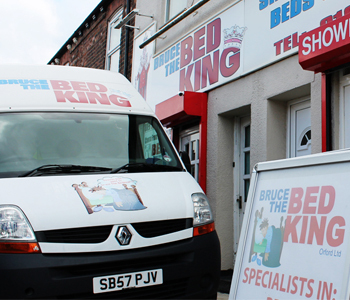 Bruce the Bed King Orford LTD is a family run business established in 2007. Selling a wide range of beds, mattresses and furniture to customers in Warrington and around the north west areas. We offer products to suit all budgets and styles. Our store displays over 30 beds and is open 6 days a week. We have recently won a ‘highly commended’ award in 2013 for having outstanding customer excellence and are very proud of the service which we offer here are Bruce the Bed King Orford. We offer a wider selection of goods in store, from pillows, duvets and headboards, to sofa beds, children’s beds and orthopaedic beds. We make special sizes to order and we can deliver locally in, and around, Warrington and surrounding areas. Our store is well established and has lots of beds to choose from including Wooden Beds, Metal Beds, Upholstered beds, Faux Leather and many more. Plus we also offer a large selection of bedroom furniture to complete your look, available to order in store. Having over 100 suppliers means we can always find something for everyone such as High Gloss, Beech, Pine, Walnut, Oak and many more styles and colour options in Wardrobes, Chests and other storage units. Feel free to read our testimonials, and if you are new to us why not visit our shop and see our offers in store. If you would like to know more please contact George or Anita on 01925 577760 or sales@brucethebedkingorford.co.uk, we are always happy to help!